The NAACP (National Association for the Advancement of Colored People) is built on the collective courage of thousands of people of all races, nationalities, and faiths united in one premise-that all men and women are created equal. February 2009, the NAACP celebrated its one-hundred-year anniversary. The nation's oldest and largest civil rights organization is captured in this visually stunning and groundbreaking book. 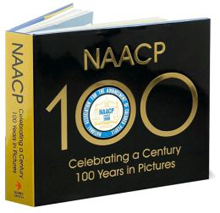 With hundreds of photos-many of which have never before been published-and many voices, NAACP: Celebrating a Century,100 Years in Pictures tells the story of the founding of the NAACP and the significant events and widespread influence of the organization in each decade leading up to today. The book covers monumental events that affect the fabric of our lives, including fair voting laws, desegregation of public schools, desegregation of the military, anti-lynching laws, fair housing opportunities, and equal representation of African Americans in the entertainment industry. The stories of James Weldon Johnson, Walter White, Thurgood Marshall, Rosa Parks, Roy Wilkins, Benjamin Hooks, and countless others shine from these pages as examples of what good and courageous people can accomplish by coming together to change the world for good. From old to young, from black to white, from the ballot box to the boardroom, members of the NAACP have led the fight for civil and political liberty, social justice, and the true enactment of freedom. Celebrate the history and centennial of the NAACP with this book that will be treasured for generations to come. The National Association for the Advancement of Colored People (NAACP) is the nation's oldest and largest civil rights organization. Founded in 1909, the NAACP has led the fight against racism, social injustice, and inequality for over a century. The NAACP has some 300,000 members in all fifty states and Germany and Japan. The dedicated workers, organizers, and leaders of the NAACP work tirelessly on local, state, national, and international levels to end discrimination and ensure the political, social, and economic equality of all people.